Today I have a guest writer. She is a wife, mother, survivor, servant of The Lord, friend, and a overcomer. I know you will enjoy reading about how she took her pain and made something beautiful. Growing up in South Jersey with a single mom and two other sisters, all we had to live on was welfare money. All my days growing up I never knew of a job that my mom had. My mom struggled with drug and alcohol issues. And so our Christmases were very simple. It wasn’t a big event and many of our Christmases just went by, then there were times when it was drowned in booze or other stuff. We learned how to deal with whatever the season brought us. All that mattered was that I had my sisters with me. But my life and Christmas changed when a short visit turned into a forever visit to my aunt and uncle’s house. Being that my mom and sisters became homeless while I was visiting, they thought it best that I stay to live with my aunt and uncle. The separation was more than I could have imagined. It was then that I learned how to cope by pretending. Pretending not to feel or care became my normal state. This went on for years and years: In fact all my Christmases were “pretend” I tried for so long not to remember, not to feel sadness. I just continued to do tradition the way I had always known, but it hurt. Years later I became a believer in Christ. Being new to the faith, I had no expectations about any of the holidays. But what I saw was that Christians didn’t really celebrate Christmas that differently from how everyone else celebrate. A few of the things I did observe was that much thought went into giving gifts to so many people: teachers, friends, mailman, just everyone and anyone. What I didn’t see was what was important. I did not see other families surround their Christmas around Christ. They may sing the right songs or tack on the Bible story of Christ on Christmas morning but that was pretty much it. And it seemed that the only time you see or hear of God was at Christmas time throw in with all the hub bub of the season. Much, of what people did was a strong focus on the tree and the ornaments. Ornament memories, memories of family members who have passed on, a child’s first ornament etc…. As years pass by all of this was too much for me. I wanted more God centered Christmas and less of people and stuff. It was completely unfulfilling and so void of anything that really matters to my faith. So my heart cried out for something different but I didn’t know how to do Christmas any differently because our culture tells us this is what how we do it. When I became a mother I really felt the pressure to do what everyone else did, but each year it frustrated me. Until, I saw one mom take charge of the holiday. I was in her home at the Christmas season and I saw she didn’t have a tree!!!! What she had were HUGE socks for each family member but I also saw her decorations were Christ focused. I ask her, “where is your tree?” Her only answer was that for her,” the tree was becoming more like an idol.” She felt God asking her to let it go and so she did. In her home I felt nothing but pure joy, this made a huge impact on me. I felt happy and relived just sitting in her living room without a tree. Somehow that sparked a new thought. It was completely possible to do something different but I really had no idea what that would look like for me. I just asked the Lord, “What do you want us to focus on?” Then the answer was clear to me, Jesus came with no fan fare, and fan fare is what I am trying to avoid! What is more powerful than HIS BIRTH?? “Unto us, a child is born.” Isaiah 9:6. Mangers are seen everywhere during the Christmas season but seldom as a central focal point. I couldn’t even find it on Pinterest. So we put a lot of thoughts and prayers into this new tradition. 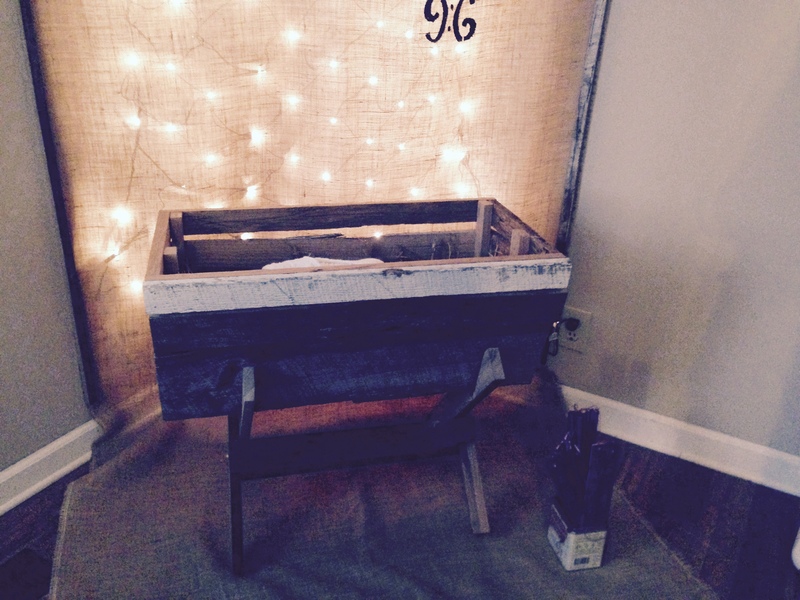 My husband, Brent, had some wood that was meant for the burn pile but he built a manger with it instead. The kids were not excited about the manger nor could they see my heart in this until my husband lovingly built the manger and set it up. Then they caught on and I could see that they had captured what I was seeing. 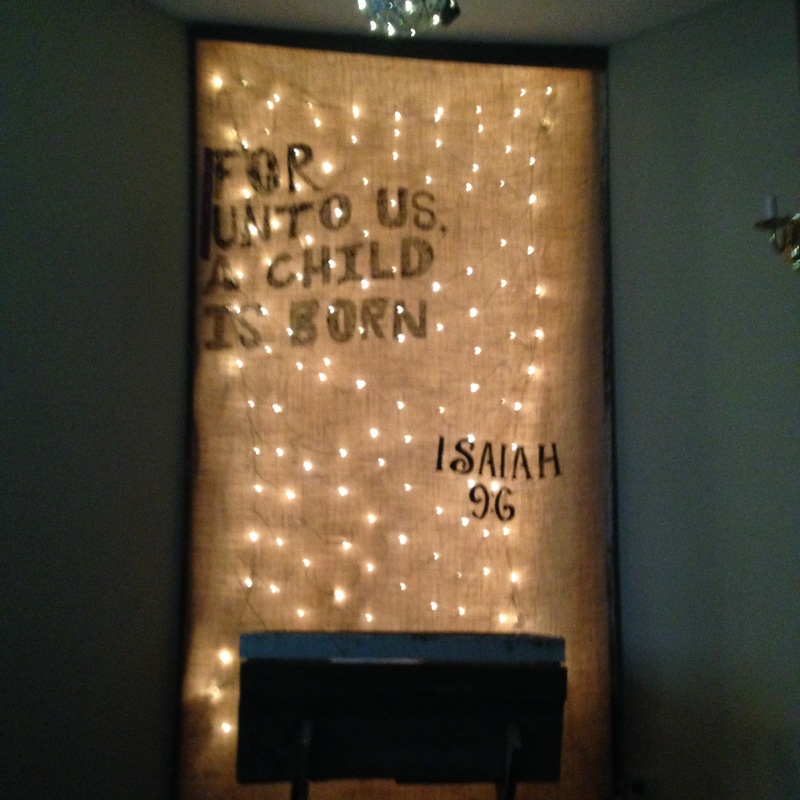 We also thought long and hard about the bible verse to display above the manger. We also came up with a replacement for ornaments, because I wanted MORE JESUS. So we took paint stir sticks and painted 26 of them with purple paint. Purple is the color of royalty. 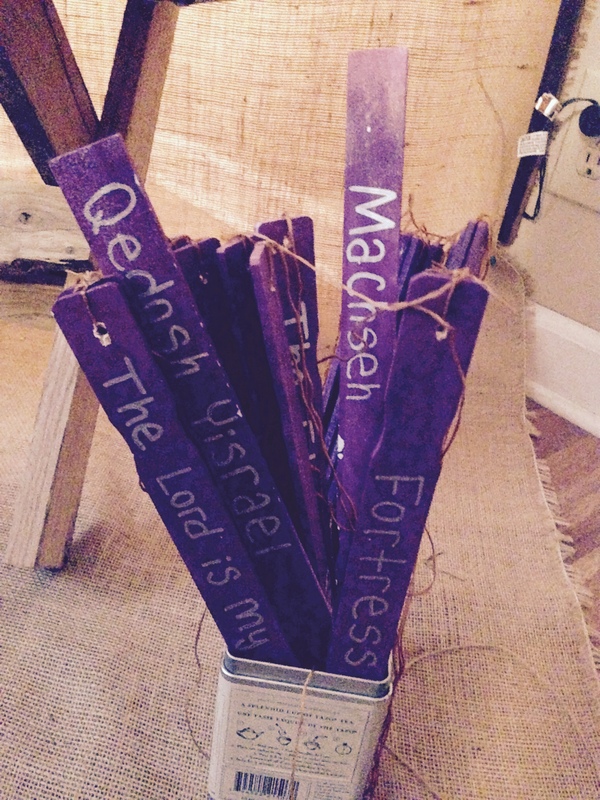 26 names of Christ on one side and the meaning on the other side to we hang them each as our advent each night. Yahweh Rophe- The Lord who heals!!!! Yes, YES, YES…. my heart began beating with excitement this is what I want for my kids. This is what I want them to know, this is what I wanted them to understand. This feels right, this feels holy, this is a time of worshiping the One Gift doesn’t have to be gift wrapped. Christmas is not about the gifts we give it’s about the gift we have been given selflessly by The Great I am.This is what I want to pass on for generations to come. Maybe YEARS down the road my grandchildren will see that our faith is built on focusing on Christ. Not on doing things just because our culture has always done it that way. But to grab onto Christ and not lose focus of HIS BIRTH. To wholly (holy) take back Christmas and have Christ as our main point and JOY. It’s what CHRISTmas is all about. Cassandra, would like for you to join her in building your own manger this Christmas. 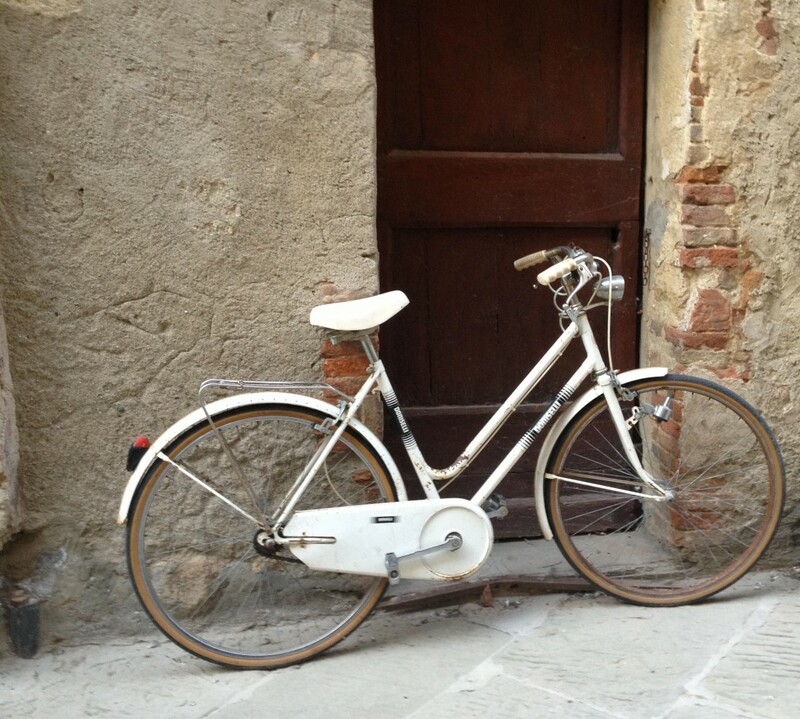 Please comment below and let us know if you build one and please snap a photo to share with us. I bought my grandson tools for Christmas can’t wait to build a manger with him. Thank you for the blessing of inspiration! Wonderful. Please take a picture of it when you are done and post it. We would love to see it. I’llbe sure tto bookmark it and return to read more oof yyour usrful information. Thanks for the post. I wiull certainly return. Thank you so much. Yes, please return and let me know if you have a site or blog.